We can’t stress enough to our clients just how strict Maryland is when it comes to gun laws. 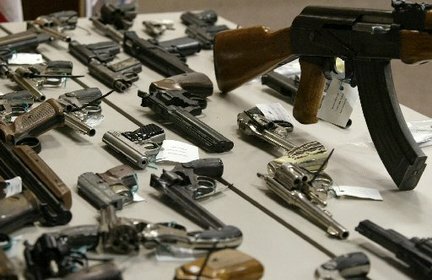 For a state that is relatively lenient when it comes to sentencing defendants on violent crimes such as robbery, the gun laws seem out of place and overly harsh. Our firm has handled numerous firearm cases and we know first hand the challenges that come with defending these crimes. Perhaps the most common of these crimes is the possession of a firearm by a convicted felon. Not only is this offense common, but it is also one of the most illegally charged crimes. Illegal searches, bad traffic stops, and unlawful arrests are three of the main ways that defendants end up with this charge. The bottom line is that most of these cases are the result of police violating someone’s rights, and we do not stand for it! If you or a loved one has been arrested or is being charged for possession of a firearm by a convicted felon contact Benjamin Herbst immediately for a free case evaluation and legal consultation. This offense is a felony under the Maryland public safety code section 5-133 for handguns and section 5-206 for rifles and shotguns. The maximum punishment is 15 years in prison and a potential 5 year minimum mandatory sentence. The mandatory sentence used to apply to all cases but now only applies to cases where the prior felony and any sentence that followed was completed within 5 years of the new charge. If you were convicted with a felony 6, 7 or even 8 years ago but got off probation less than 5 years ago the mandatory prison sentence will apply to your case upon conviction. If the sentence on the prior case ended more than 5 years ago the judge has the option of whether to impose the mandatory jail sentence, which in essence means there is no mandatory sentence. Many defendants are not aware of these harsh laws, until they receive notice from the State about seeking a mandatory sentence, which is exactly why an experienced lawyer is so important. There are often other implications as well with these types of cases such as potential violations of probation, so the stakes are extremely high, and a skilled lawyer can be the difference between jail and freedom. There are a variety of pre-trial motions that can be filed on your behalf in order to achieve the ultimate goal of a dismissal, and we will take on the police and the prosecutors at all stages of the case. Benjamin Herbst has had cases dismissed by arguing and winning motions to suppress evidence in the past and is prepared to do the same in your case. Not all of these cases are the result of illegal searches and or arrests, but even if the cops are not acting out of line there are still numerous ways to prepare a defense. The state must prove that the defendant actually possessed, owned, carried, or transported the firearm. They also must prove the prior conviction with a certified copy, and if you are an out of state defendant the prosecutor must obtain a certified conviction from that state. We never assume that the state will be able to prove any elements of this crime, and we will never convince our clients to plead guilty unless it is absolutely the last and best possible option. The gun laws may be tough buy not all state prosecutors and judges are in agreement with the punitive nature of these offenses. If your case calls for negotiation we will do everything in our power to put you in the best possible situation for a plea deal. Benjamin is available to discuss your case 24 hours a day and can travel to meet you wherever is convenient. He has represented numerous clients from other states such as Florida, Virginia, and Pennsylvania, and understands how out of state residents are caught off guard by these laws. For more information on Maryland gun laws click the link to read articles authored by Benjamin, and to set up a consultation call 410-207-2598 anytime. Benjamin handles firearm cases in all jurisdictions including Baltimore, Prince George's County, Frederick County, Montgomery County, Western Maryland and the entire Eastern Shore. He offers flexible payment plans for all misdemeanor and felony gun charges and never wants finances to prevent a defendant from receiving the best possible representation.